I'd like to thank everybody who took the time to "comment" on the painting in the previous post. I received a lot of good advice and positive feedback about the Chevy. I appreciate it. I'm not sure what I'll do with the painting. To tell you the truth, for the moment, I'm really pretty happy just having it hang in my office. Above is the first post of five new paintings I have earmarked for Twinhouse. A small, really perfect tomato I picked up at the Kroger. This hasn't been delivered to the gallery as yet. I'm going to wait, and take them in together when the group is complete. If you're interested in the purchase of this piece, you can contact Tiffany at Twinhouse by clicking here. This is not a recently produced painting, but it is one of my favorites. I did it a couple of years ago for a show at Twinhouse gallery. It wasn't particularly well received, and has since been "dissed" by all of my galleries. None will show it. "Can't sell it", is the universal reply. This was the same response my second auto painting, "Chevrolet" received. At first I believed this subject could be a major direction for my work. This obviously turned out not to be the case. I'm sure the gallery directors, and owners, know their clientele, but it remains a source of disappointment for me. I believe these two paintings represent some of my best work to date. 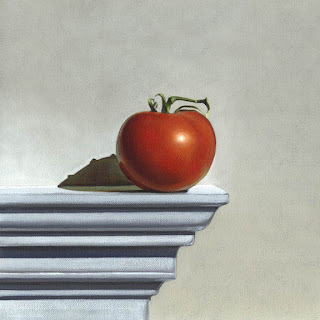 Anyway, while I'm working on a new group of still life paintings, I thought I'd bring some attention back to this piece, of which I'm very proud. In a day or two, I'll begin to post the five new paintings I'm currently working on. I would like to say to all of you who have taken the time to leave "comments" on this blog, thank you. I read them all, derive a great deal of pleasure from the kind words, and take them very seriously. Each painting is a struggle for me, and it's very reassuring to read that my intent with each piece, at least with some, has been achieved. Many comments have brought to my attention aspects of the painting that I hadn't been aware of. So again, thanks. They are very much appreciated. This piece is currently at Wynne/Falconer. I hadn't done a pear in a while, and it's one of my favorite fruits to paint. 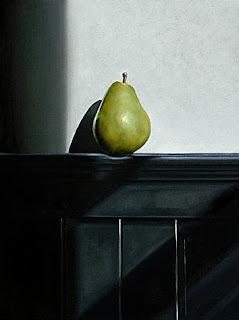 This pear sets on the ledge of the wainscotting in the home of my gallery owner here in Atlanta. If you'd like purchase information for this painting, click here. Here's the second of the four new ebay paintings. 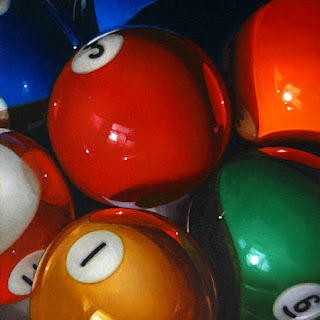 Once again - Pool Balls. I've been toying with the idea of doing this subject really large. One of my favorite realists artists, Pedros Campos, creates these beautiful paintings of fruit in cellophane bags, and they are very large. Forty eight inches square. I thought it would be challenging to try something like that myself. 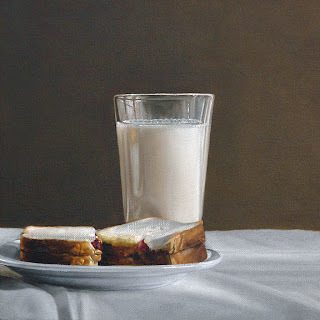 Really get into the meat of the subject, and deal with all of the subtleties of value, and reflection. I wouldn't attempt a format quite that large, but possilby 30 x 30. This piece is a six by six, but the composition has been cropped, so that the subject is slightly overscale. Sort of a tentative first step in this project. At this point it's still just an idea, but it's something I've thought about for quite a while. Hopefully I'll find the time, and the courage to actually do it. If you'd like to bid on this painting, you can do so by clicking here. I've been working on a few new ebay pieces this week. Here's the first of (hopefully) four six by sixers. 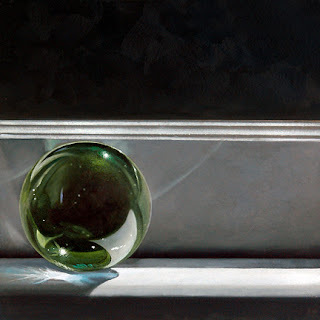 The mood struck me this week to do something transparent, so I got out one of my small glass spheres, and placed it on the window sill in the sun. If you'd like to bid on this painting, you can do so by clicking here. Here's more of what I've been working on for the galleries. Peanut butter and jelly. There seems to be a bread theme developing here. I think I'll be exploring this subject for a little while. It's been fun trying to add a bit of texture into my paintings. This piece was just shipped off to New York along with the Pool Balls, and Sliced Bread to Stricoff Fine Art. If you'd like to learn more about this piece you can find contact information by clicking here. Here's the fourth of the eight finished paintings. I'm back to my favorite Percolator. This will also be one of my entries representing Twinhouse at this years ArtHouse. I wanted to work on a table cloth that was flatter, and not so bunched up, like I usually do. My goal was to show more subtle creases, and latent folds. I think with this piece, the coffee pot, and linen share equal billing. If you'd like to learn more about this piece you can find contact information by clicking here. Here's the third of the eight finished paintings. 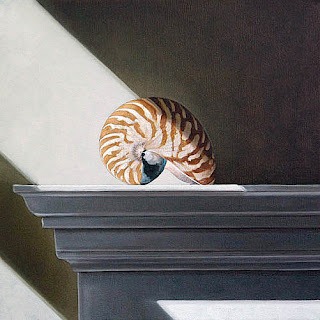 I love this Nautilus shell. I've painted it twice before, but couldn't resist doing it again. This will be one of my entries representing Twinhouse at this years ArtHouse. Once a year the Atlanta Gallery Association leases a newly built mansion for a month, and fills each room with artwork from the member galleries. It's a great way to visit a lot of Atlanta galleries without having to drive all over town.If you'd like to learn more about this piece you can find contact information by clicking here.